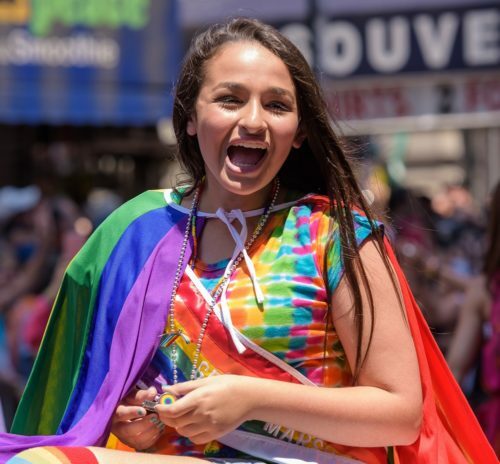 Transgender activist and YouTube personality Jazz Jennings cut right to the point in her response to Derick Dillard’s comments about her. Dillard is the husband of Jill Duggar-Dillard, a Duggar daughter. The Duggars, a Quiverfull family that had its own reality show on TLC for seven years called 19 Kids and Counting, are known for their extremist worldview. Their show was cancelled in 2015 following allegations that the Duggar’s eldest son, Josh, molested five underage girls including four of his sisters. He then followed up that tweet by saying that he loves the sinner but hates the sin… and deliberately misgendered Jazz, because that’s how you show people you love them. A lot of responses on Twitter are supportive, of the “You go girl!” sort. But it’s really sad that anyone has to grow up knowing that a significant portion of the country hates them, just as it’s sad that grown men like Dillard will complain that they’re the ones who are really oppressed if you call them out for their hatred.